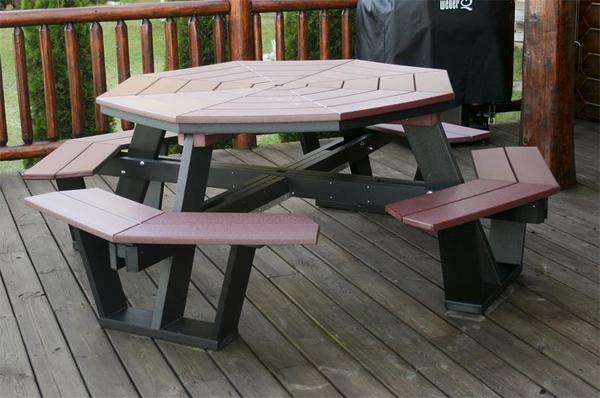 From the occasional family barbecue, to enjoying a casual meal outdoors, our Poly 5' Octagon Picnic Table is a beautiful addition to your outdoor dining space. Crafted from eco-friendly poly lumber, with a classically inspired design, this eight person table is sure to be the "go-to" for any get together. Each table is available in an array of beautiful, vibrant poly colors that allow you to customize this piece to fit your outdoor space. Choose from the many standard popular solid colors - white being the most common, with weatherwood, tudor brown, and cedar giving off the most natural look - to the bright, tropical colors that will make your table a statement piece. You can also combine two of your favorite colors to match your space, represent your favorite sports team, or combine two tropical colors for a designer look. Made from recycled milk jugs and detergent bottles, poly lumber offers a simple way to go "green" by keeping these plastics out of landfills and turning them into beautiful outdoor pieces that are made to last decades. Because of the longevity in these pieces, you will not be forced to replace plastic outdoor furniture every few years and your days of sanding and painting wooden furniture are over. Each piece of poly furniture offers a maintenance-free solution to outdoor living. Poly lumber is also impervious to many of the downfalls that prematurely ware other outdoor furniture. Extruded with a UV inhibitor, those vibrant colors you choose will stay looking great and will not fade with the sun, or weather away from salty sea air or a long winter freeze. You can also count on your poly furniture to never splinter, crack, rot, or chip, leaving your furniture looking new for decades, even when left outdoors all year long. Click here to learn more about the benefits of investing in poly outdoor furniture. Table Top Width - 60"
Overall Width (with Benches) - 89"
Any two-tone color combination is available. When selecting two-tone colors, please note the primary color will be the table top and bench seat tops, while the accent color will be the base.